The meeting was called to order by Mayor Hall at 7:00pm. Deputy Mayor Salomon was away on personal business. 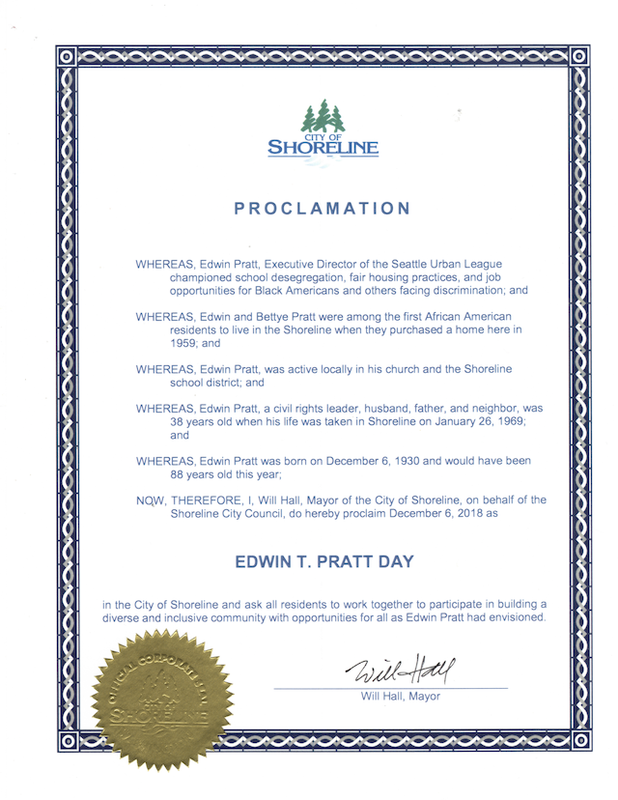 The Mayor proclaimed December 6, 2018 Edwin T. Pratt Day. 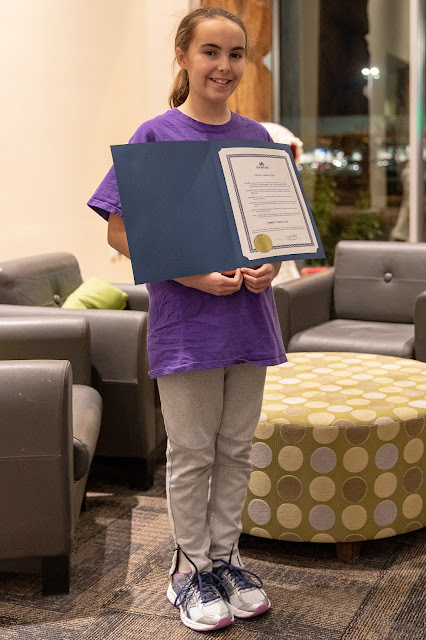 Sarah Haycox, the Meridian Park Elementary student who launched the community action to name the Shoreline School District’s new early learning center after Edwin T. Pratt, accepted the proclamation on behalf of the community. Community and Aquatics Center Concept Design open house occurred this past week. It was attended by 125-150. There were requests for a dedicated area for senior services and changes to the pool to include 8 lanes, a diving well, and a viewing area. “Under Our Skin” video and discussion was attended by 25 residents. Cultural Conversations - Holiday Celebrations will be held Tuesday, December 4 6:30 - 8:00pm at Spartan Recreation Center. It provides an opportunity for women to discuss their different cultural experiences. Breakfast with Santa will be Saturday December 8 at Shoreline Senior Center. There are still openings for the second seating at 10:45. Adults $17/Kids $12 call 206-801-2600 for tickets. Shoreline Social Justice Book Club will meet Sunday December 9 from 2:00 to 4:00pm in the Council Chamber. The Book is “So You Want to Talk About Race” by Ijeoma Oluo. On Monday December 10 6:15 - 7:00pm there will be a Reception for Deputy Mayor Jesse Salomon to thank him for his service on the City Council. He is resigning from the Council to serve as Senator for the 32nd District. The reception will be in the City Hall lobby. Shoreline City Council is taking applications for Salomon’s now open seat. Applications will be closed Jan 3rd at 5:00pm. Public reminders: Parks Funding Advisory Committee meets Wednesday December 5 at 7:00pm in the Council Chamber. The PRCS/Tree Board meets Thursday December 6 at 7:00pm in Room 303. The Planning Commission also meets Thursday December 6 at 7:00pm in the Council Chamber for a public hearing on potential expansion of the Deep Green Program for commercial properties. Mayor Hall attended a meeting last Friday of all cities along the bus rapid transit lines. Shoreline’s focus is making sure the intersection at 145th street and the I-405 connection work well. At an event Wednesday The Mountains to Sound Greenway Trust recognized the City’s Ballinger Neighborhood reforestation that is generating carbon credits. Councilmember Chang: PSRC regional TOD attended by phone. She said it was difficult to follow because she couldn’t tell who was speaking. There was discussion about density around light rail and whether there was something they could do to encourage it. Chang advised them that giving up local control is not something that we would support. Another speaker said PSRC/TOD actually uses Shoreline as a model for what they want done. Additional comments were made about preventing gentrification and encouraging equity. The Mayor added that the State might want to impose minimum increased density around transit stations and that he, Councilmember Roberts, and City Staff have prepared a letter that will appear in the next edition of AWC explaining what Shoreline went through and how important local control is. John Osborne stated that Seniors walking the Interurban Trail are in danger of serious physical injury from speeding bicycle riders. He also commented that the public portable bathroom (Sani-can) at Echo Lake is disgusting and so bad he would not want his grandchildren to use it. He wasn’t looking for drug paraphernalia. The public facilities have to be maintained. Maybe it needs emptying several times each week. He provided pictures to the Council. Nathan Wayne stated that $17 is too expensive for the Santa Breakfast. Many people cannot afford that. The Agenda was approved by unanimous consent. Staff report presented by Margaret King, City Attorney. In the rezone areas, a lot of the subdivisions have restrictions going back to the 1920’s. Many of these restrictions are unconstitutional. The problem is, Shoreline does not have a process for addressing plat changes. In order to change the plat of the subdivisions, Shoreline would have to follow state law. This is a cumbersome process: all property owners of the plat must be notified, a public hearing may be requested by a property owner receiving the notice, and the City Council may deny or approve a plat alteration. The proposed new City regulations will make it a quicker process, while still keeping protections in place for homeowners. Staff recommends adoption and would like it retroactive to December 1, 2018. Councilmember Scully: He concurs with Staff. These are very dated sentiments of what the City should be and the fewer roadblocks to eliminating them, the better. Councilmember McGlashan: Why are we working on “interim” regulations? Answer: interim regs allow us to skip an up-front public hearing process. It allows an immediate reply but only for 6 months. We can then have the public hearing process during those 6 months. The goal is to get it into place permanently. Councilmember Chang: are they trying to get old plats to match what current zoning is? or would they be going beyond that? Answer: any owner of the property can get a plat amendment or alteration. Staff would be reviewing case by case. The majority of amendments are expected to be use/size /subdivisions restrictions. Since the up-zoning, the old plat restrictions are inconsistent with current zoning. Mayor Hall: to express this in another way, the City has zoning in place. If plat alteration is requested, can it go past current zoning? Answer: No it cannot. The zoning is in place no matter what. Plat alteration does not change current zoning. Councilmember Roberts: do you anticipate this procedure will be striking out lines of old restrictions and not adding new language? Answer: Yes. just getting rid of old restrictions. Roberts: Is this done property by property? or for the whole plat? Answer: On the whole plat. You can do a specific property but that would be if the restriction only applied to that specific property. Roberts: Can we legally do this retroactively? Answer: Yes, since we don’t have a process currently in place. There are plat alteration requisitions that haven’t been processed yet, and using a December 1 date would clarify that these requests are pending, so they don’t have to start the process over again. Council agreed it will be nice to have an administrative process instead of each application having to go to council. There was some discussion of the need for a retroactive date. Staff will confirm that there are no pending requests (since there is no process in place). New applicants will be told to wait until this is effective. This will be set for Consent next week to be effective immediately. The public meeting was adjourned at 7:40pm to be followed by an Executive Session.